As our optical technologies improve we’re increasingly able to see the universes building blocks in ever more minute detail. If you paid attention in science class you know that atoms make up everything. They’re the smallest unit of matter, and everything you’ve ever touched, felt, or breathed is made up of matter, including your own body. They’re so small, in fact, that actually seeing an individual atom is pretty much impossible without the use of high-powered microscopes, even though recently researchers did, for the first time, manage to see individual atoms interacting with each other. Now a student from the University of Oxford has taken a truly remarkable photo showing a single atom captured in space, and it was awarded first place in the Engineering and Physical Sciences Research Council’s annual photography competition. 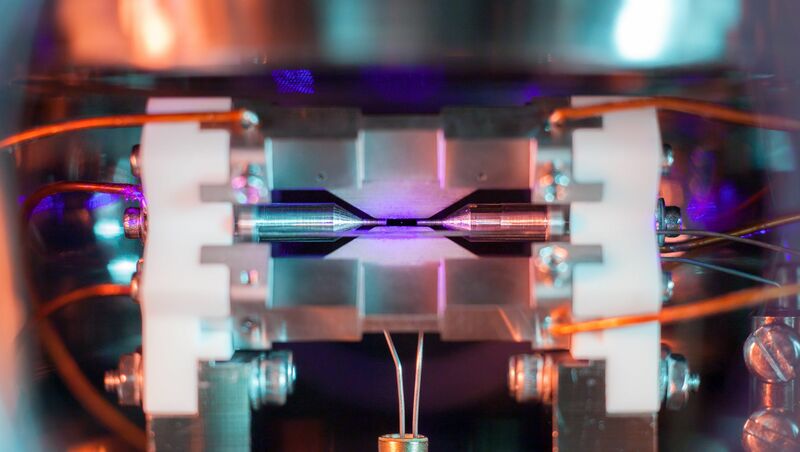 In the photo, a single atom of Strontium, which is the largest type of atom, is held almost perfectly still by an electrical field generated by a pair of electrodes. A laser excites and illuminates the atom, which shines like a tiny speck of dust caught in the glare of the sun. Still, you probably have to squint to see it. It’s not every day you get to see one of the fundamental building blocks of reality, but there it is, in all its glory.